Dear people the starting shot for the RV has been given, GESARA will now be announced soon. From the information below you can read that the Euro is uncovered counterfeit money, the FED has been declared bankrupt, where also the ECB and the Euro have become invalid, just like the unelected corrupt EU. Those who still give money to the bank can assume that this is not their property for long as the balance of customer accounts fall into the bankruptcy of the Euro. In order to prevent chaos and save the economy, the RV will have to take place now, and we can expect 14 days of exciting time. By the conspiracy of Western politicians, the Neo-Liberal NWO fraudsters like Rutte, Merkel, Macron, and unelected Globalists of the UN and EU crooks, the whole house of cards collapses. We therefore do not declare the Marrakech Migration Pact legally valid and claim our sovereignty for the rest of the world. Thank you very much for all those who have engaged in this struggle and HONEY for the good of all mankind. Of course, all state and central banks around the world are involved by this Global Scam. Declaration by the People’s Chamber of the Republic of Germany. To all Citizens and customers. Branches and Banks, of KFW Banken Group – All Deutschland Banks – HRB – Null. Member of the German Government and private owner of the KFW Banker Group. 1. The banks of KFW Group in Europe are closed and become state property! 2. Viable Banks have until 31 – 01 – 2019 to present an opening Bilans. The banks of KFW Group are from 01 – 01 – 2019 massively popular property. Since 17 – 07 – 1990 these banks of the KFW Group have been a private company of Schäuble GmbH ( BV ). Despite remediation by means of Staatsbank, no notifications were made. It also failed to notify the banks in Germany on a trustworthy basis, as its own Berlin State Bank until 1994, if the Bankruptcy Application was filed on 31 – 12 – 2017 with the Assets – Balance Sheet and all repayments of loans from customers. Shamelessly they have acted through predatory blackmail! Since the Government Bank, with the help of the Federal Reserve since 1969, has been working with deception and counterfeiting of bilans, as if with the false gold reserve, and even the ECB with stolen gold introduced a false money valuation (EURO) – the State Bank ended this sham enterprise the EU! The deadline of 31 – 01 – 2019 is also the binding obligation – People’s property of Germany! 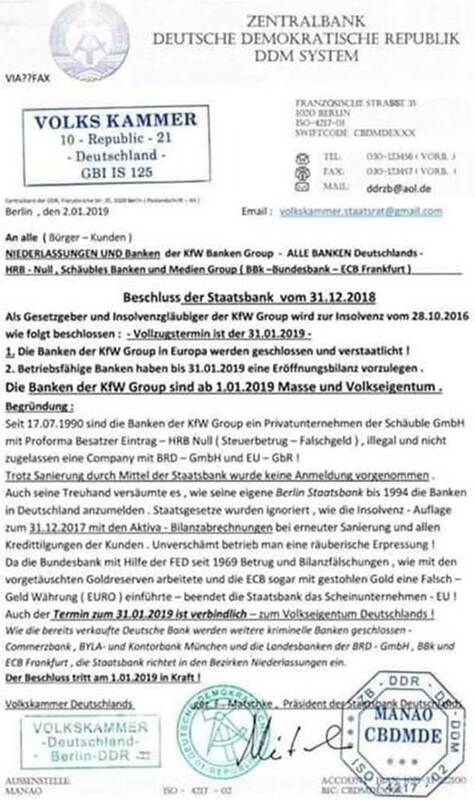 If the already sold Deutsche Bank were further criminal banks were closed – CommerzBank, BYLA and KontorBank, Munich and the Landesbank der BRD – GmbH, BBK and ECB Frankfurt, the State Bank establishes branches in the regions. The decree shall enter into force on 01 – 01 – 2019.